“As far as the eye can see.” How many times have we heard, and even uttered, those words without really considering their true meaning? Just how far can the eye see? Adults use the expression to convey wide open spaces, and as a kid I remember arguments on the playground about who had seen the farthest, trying to one-up each other with our ocular feats. To me the words “as far as the eye can see” reveal a misconception that our eyesight somehow travels to a distant location and returns a real-time picture of a person, tree, building, mountain, or whatever for our brain to process. That perception might work for terrestrial scenes, where the time it takes a distant image to reach our eye is so imperceptible that for all intents and purposes, we are witnessing the scene in real time—what we see is happening as we see it. Let’s take a tour of this night scene from the Grand Canyon to see how that real-time visual model works. Standing at Mather Point on the South Rim, our eyes start with nearby trees lining layered sedimentary cliffs, quickly plummeting to the river-scarred basalt of the inner canyon nearly a mile below. Beyond rise the similarly layered wall of the canyon’s North Rim. So far our eyes have traveled only ten miles or so—on a clear day they could continue another hundred miles or so before dropping off the horizon. Scan any terrestrial scene this way and it’s easy to believe our eyes have done the work—when we see an object, we feel like we’re sharing its simultaneous reality. But this shared reality concept falls apart when you elevate your eyes above the Grand Canyon and beyond the horizon to the celestial sphere overhead, where everything we see (except the small meteor that’s burning up in Earth’s atmosphere, just a few miles away) was over and done years before it entered my lens. That delay is the time it takes starlight to span the immense distances of interstellar space. Instead of a simultaneous reality, each star in our sky is on its own clock. In other words, we’re not seeing the stars in this image as they are today, we’re seeing them as they were tens, hundreds, or thousands of years ago. But back to this distance thing. If starlight takes so long to get here, how far did it travel? Or more specifically, just how far can the eye see? Consider that light travels about 186,000 miles in one second. That’s more than 15 billion (twice the population of Earth, BTW) miles in a day, and nearly 6 trillion miles in a year. These numbers are beyond human comprehension, but suffice to say, a light year is a really long way. So the next time someone says “As far as the eye can see,” remember this image. Ten miles to the opposite rim of the Grand Canyon, or 100 or so miles to the horizon, aren’t even a drop in the interstellar bucket. To comprehend the limits of our visual distance, individual stars are a good place to start, but they’re still in Earth’s general neighborhood. Beyond the pinpoint stars, this image captures the glow of our Milky Way Galaxy’s spiral arm in which our Sun is a very small player. This glow is a few thousand light years distant—now that’s more like it. But wait, there’s more. In Sagittarius, opposite the view in this frame, is our galaxy’s center. There the Milky Way’s glow reaches our eyes after traveling a mind boggling 25,000 light years. Surely that must be the limit of human vision. But before you run out and brag to friends that you can see 145,000,000,000,000,000 miles (the distance light travels in 25,000 years), we’re still not done. See that roundish smudge of light on the left side of the frame? That’s the Andromeda Galaxy, the Milky Way’s nearest neighbor, 2.5 million light years away (not counting refueling and bathroom breaks). At 14,500,000,000,000,000,000 miles (count the zeros—moving from left to right, each zero increases the distance by 10 times), that truly is as far as the eye can see. Last week I helped Don Smith with his Northern Arizona workshop. After a 12 hour drive from California, Don and I had dinner near the South Rim before heading out to chilly Mather Point to try our new(ish) Sony a7S mirrorless cameras in what is the most difficult location I’ve every tried night photography. Because I do everything with one click or not at all, I’ve never had any success photographing the stars on a moonless Grand Canyon night. 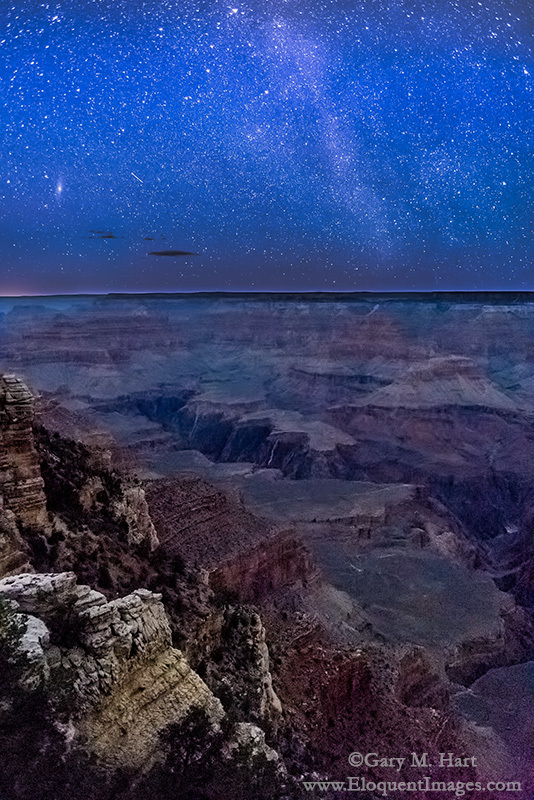 Moonless night photography is difficult in any location, but at the Grand Canyon it’s like photographing a black pit. Honestly, I never imagined I’d be able to make it work. A close look at this image will reveal that it’s not perfect—there’s a fair amount of noise, and a little motion in the stars (and every flaw is made worse by jpeg compression). Cleaning up the noise softened the image some, but eliminating it completely resulted in an noticeable plastic look, so I tried to find a balance. But flaws notwithstanding, given that the only thing illuminating my scene was the stars and a faint (imperceptible to the eye) ambient glow from the sky, to get this much detail in so much darkness is nothing short of amazing. This is just my second night shoot with the a7S, so I’m still working out the best combination of f-stop/ISO/shutter-speed variations. I haven’t scrutinized all my images yet, but I have many variations to play with, both from this night at Mather Point, and from the next night as well, when Don and I took a hardy few from the workshop group out to Yavapai Point. One thing that is an absolute game changer for me is the ease with which I can focus on the stars with the Sony a7S. With my Canon 5D Mark III and its (pretty great) LCD, I am able to live-view manual focus, but it takes some work. With the a7S, focusing is just a simple matter of putting my eye to the viewfinder and dialing the focus ring until the stars sharpen—a couple of seconds at most. Composition is also much easier with the a7S. But clearly there’s room for more image quality, as the extremely limited light of a moonless night at the Grand Canyon forces many compromises. My Zeiss 28mm f2 lens is generally quite sharp, but it’s noticeably less sharp at its widest apertures. And there’s quite a bit of noise at 25,600 ISO (but the fact that I can shoot anywhere near that high is simply amazing). Of course I’d like to use an even higher ISO to allow a smaller (sharper) aperture and faster shutter speed (less star motion), but I won’t be greedy (yet). Right now I don’t know what excites me more about the a7S—that I’m able to capture night scenes I never dreamed possible, or what low-light technology Sony will deliver next. It’s a great time to be a photographer. Keep up the good works! I think your photography is great and your technical prowess is amazing. Your descriptions of your activities are a must read for me. Thank you, Ralph. And thanks for taking the time to read my posts. I read Don Smith’s post from the same night. The A7s is amazing camera to see so well in so little light. One thing I noticed in the pictures in both posts is that the stars seem a bit soft. I’m assuming that is due to the resizing to make the JPEG image. Is the full size image available to view any place? Thanks for all the great info. It’s not, Jeff. I uploaded moderately compressed 800×534 pixel jpg (my standard size for web display), but I have no control over what WordPress does with it once it’s uploaded. Thanks.